The purpose of this article is to alert both the public and the authorities to the real danger posed by potential future landslides in Kandy, or, in particular, to highlight the threat posed to private dwellings and other buildings such as schools that lie on the path of potential landslides endangering life and property. The intention of this write-up is not to sensationalise or bring undue fear to people, but to create awareness on the seriousness of the problem for the benefit of the affected people and to alert authorities on the need for prompt action. Furthermore, appropriate short-term and long-term remedial measures that can be taken are mentioned for the benefit of those affected from landslides in Kandy to counter this new grave problem that has suddenly descended on the Kandy hills. It is emphasised that the authorities need to take substantial action such as drawing up and enforcing new codes of Practice to regulate building construction and other human activities on the hill slopes of Kandy because, unlike other hilly regions of Sri Lanka, Kandy is a heavily built-up area and building work continues to expand. 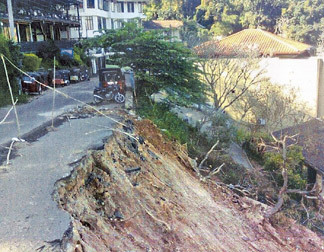 A large number of landslides have already occurred in Kandy in January 2011. Therefore, urgent action is also needed to implement suitable remedial measures to mitigate and control the landslide problem in the potential landslide zones of Kandy. Although this report details the landslide problem in Kandy, the basic facts stated herein are applicable to developments carried out in any other hill zone in Sri Lanka that faces the landslide hazard. While landslides are common in most hilly areas of Sri Lanka, it was quite puzzling as to why so many landslides occurred in the Kandy hills, all of a sudden, in January 2011. In the past, Kandy did not suffer many landslides compared to other hilly areas of Sri Lanka (such as Nuwara Eliya, Badulla, Hali-ela and Ratnapura) which experienced multitudes of continuous and serious landslide problems over so many years during rainy seasons. Hence, it became necessary to look for a possible clue for the sudden spate of widespread landslides suffered by Kandy. Consequently, both rainfall records as well as any possible occurrence of ground tremors were looked into. Initial inquiries from the Geological Survey Department indicated that the Pallekelle seismograph (one of three earthquake recording stations in Sri lanka - as informed by an officer from the Department), has not recorded any significant earth tremor in recent times. However, checking the rainfall data at the Meteorological Department clearly indicated that a very unusual rainfall event which can be categorised as (in civil engineering terms) a peak “event of 60 years or more” has taken place during the months of December 2010 to January 2011. This can be further elaborated as follows. What affects landslides is the cumulative effect of both the amount of rainfall as well as the rainfall duration period. This is because, the longer a continuous rainfall period lasts, the greater the wetting of ground from absorption of water. When rain is continuous over a longer period of time, more water can seep into the ground causing the soil-overburden on hill slopes to become weaker and heavier, creating greater potential for the earth to slide down the hill. When rainfall amount and duration data for Kandy were checked for the past 60 years (no records were available beyond 60 years), it became very clear that the January 2011 event was the worst such event - accounting for a cumulative affect of rainfall amount and duration of a continuous rain period - that has occurred during the past 60 years (or possibly more). While rainfall amount and duration are the primary factors that contribute to landslides, clearing and cutting on hill slopes for development work such as construction of buildings (as was the case with most hill slopes of Kandy) also made a secondary contribution towards landslips. It should also be emphasised that the blame for landslides does not lie on the peak rainfall event alone. Obviously, the blame also lies with human failure to take adequate precautionary measures on the developments carried out on the Kandy hills. During a short tour taken through the Kandy town region on January 22, it was possible to see numerous landslides throughout the Kandy hills. Many of the landslides observed had taken place on the cut/fill areas adjacent to buildings. Also, these landslides which mark the commencement of earthslips in those locations expose the nearby buildings to danger from future slides that can occur when severe rain period recur. The pictures clearly indicate the present precarious state of various buildings after the initial landslides of January 2011. A critical point that needs to be highlighted here is the enormous danger posed to schoolchildren who occupy classrooms that lie on the path of landslides already initiated on the hill slopes of Kandy. They need quick remedial measures to be taken. It is true that rain water causes landslides to occur. However, failure to adhere to proper Codes of Practice in hillside development work has been the major reason why most of those Kandy landslides occurred. If proper measures such as construction of earth retaining structures and providing adequate means of storm water drainage were taken, many of these landslides could have been prevented from taking place. 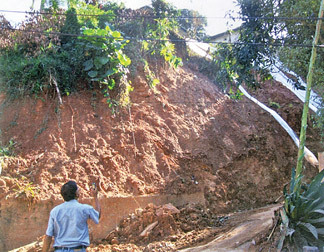 If proper regulations governing hillside development work are not established and enforced, the landslide problem in Kandy will continue to get worse during prolonged rainy periods, resulting in enormous threats to life and property in Kandy. Any illegal development work on the hill slopes can be considered a criminal offence because of the landslide danger posed to those living below and above the development. In particular, very stringent legislation should be drawn up to protect schoolchildren and school buildings when any development work is permitted above an existing school. It should be mentioned here that in advanced countries such as the USA and Australia, before any such development is approved by the relevant local authorities, a soils/ geotechnical report indicating all the necessary earth retaining structures and foundations., must be submitted for assessment by competent engineers of the local authority, such as the City Council. In those countries, let alone hillside developments, in general, a geotechnical report needs to be submitted in the construction of even a single-storey dwelling on flat land! There is a lot that we need to learn because we have been permitting new development work on our hill slopes without any requirement of a geotechnical assessment, thus endangering the life and property of those who live below or above the new development. In particular, all existing developments located above school or other public buildings should be subject to complete and urgent reviews to assess any possible threat of landslides and, if necessary, to implement suitable precautionary measures. It could be a committee, headed by a geotechnical engineer, formed from engineers and other scientists already employed by the government and/ or private sectors in Kandy including lecturers of geotechnical engineering from the Engineering Faculty of the Peradeniya Campus. For such a body to be effective, the engineers and scientists should preferably reside in Kandy so that they could promptly attend to landslide emergencies in Kandy, thus avoiding delays that could increase the danger to life and property. 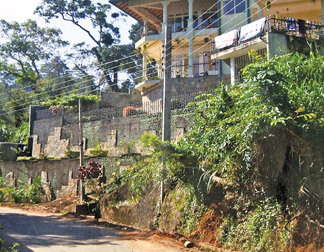 Those living in the Kandy hills, for their own interests, should organise themselves and make representations to the authorities such as the Kandy Municipal Council or Urban Development Authority to compel them to appoint a committee to oversee and advise on matters relating to the landslide problem in the Kandy region. People do need protection for their lives, as well as their dwellings and access roads. Owners of affected buildings can consult qualified geotechnical engineers to seek appropriate remedial measures such as the construction of retaining walls. However, in many instances, it will be obvious even to a non-technical person that provision of simple, sufficiently strong retaining walls accompanied by suitable drainage facilities at site will suffice to arrest the landslide problem. The retaining walls should have weep holes and perhaps lateral drains to release build-up of water pressure behind the walls. It should also be pointed out that the cost of retaining walls would be minuscule compared to the potential loss one would suffer from damage to or loss of buildings in landslides not to mention the threat to life. Earthslides can become progressive with time because the earth situated on hill slopes has the potential to slide down when weakened by the absorption of rain water and from other human activities, such as cutting of slopes, denuding of slopes from vegetation and failing to provide adequate drainage conditions. When landslides commence, unless proper corrective measures are taken, progressive slipping of earth will continue to take place during future rain periods. Since landslides are caused mainly after rainfalls, it is prudential to take some immediate low-cost remedial measures to mitigate the progression of the landslides that have already been initiated on the slopes. If such simple measures are not taken immediately, the potential is there for the landslide situation to be greatly aggravated from future rainfalls with the increased potential for further loss of property and danger to life, and also necessitating more expensive corrective measures in the future. * Inspect the site well and cut temporary surface drains to divert the rainwater away from the affected landslide zones. Make sure that the water is diverted to the existing permanent drain system or safe areas within the premises so that the water from the temporary drains will not lead to new landslide problems elsewhere. * Close all ground cracks, particularly those on the upper slopes, with clayey soils to minimise the seepage of rainwater into the potential landslip zone. * Use a mortar mix (e.g.) 1:4 cement:sand) to make markers on the cracks. The markers can be made by filling a small length of a crack (20 cm or longer) with the mortar mix so that future movements of the slip can be monitored easily by visual inspection with the passage of time. This visual inspection can be used to identify areas needing more urgent corrective measures ahead of other slip areas. For each landslide site, long-term remedial measures should be decided after carrying out sufficient geotechnical investigations and analysis. Often, a simple visual inspection will be enough to decide on the corrective measure needed. Determining existing building foundations in relation to the bedrock profile. Such information is of prime importance to establish the safety of buildings that face landslide threats and to determine the extent of corrective measures needed. If any available geotechnical reports and/ or structural drawings of the affected buildings show that the building foundations are directly resting on the rock instead of the soil overburden, then those buildings will be mainly safe unless any problems exist with the bedrock itself. Obtaining these data from existing past reports and engineering drawings is essential to carry out the corrective measures properly and to prevent doing expensive remedial measures that are unnecessary. Upon investigations and analysis, the landslide sites that appear to be most risky and urgent should be selected for remedial measures based on a priority list of sites. Needless to say, the safety of occupants of buildings is of absolute priority. Particular emphasis is given to buildings such as schools where large numbers of students congregate. While classrooms may be used in dry weather periods, during severe rainy period, students should be removed from classrooms that face the landslide hazard unless sufficient long-term corrective measures have been taken. Urgent attention is observed to be needed at Dharmaraja College, Vidyartha College, Gothami Balika Vidyalaya and Hillwood College in Kandy. The much talked about ‘Global Warming with Greenhouse Effect’, which is suspected to have caused drastic changes in weather patterns all over the world (e.g. worst ever flood disaster in Brisbane, Australia and extensive landslides in Brazil causing over 600 deaths) may be the reason for the Kandy peak rainfall event of January 2011, that led to a large number of landslides on the hill slopes of Kandy. Under such global changes, it is not possible to rule out the recurrence of another peak rainfall event in Kandy at anytime in the future. Hence, it is only prudential to be prepared for any such eventuality, which means proper landslide corrective measures should be taken as soon as possible on all the potentially unstable built-up areas of Kandy. As landslides have already started in the Kandy hills, it is necessary to continuously monitor the slopes in the future. Simple inspection of the ground for possible future landslips is very important for early warning signs. There could be areas that have undergone small slip movements, but have gone unnoticed at present but could move further after future rainfalls. Mortar markers can also be used.We may be inclined to be complacent and assume that the hill slopes are standing fine at present and hence there is no imminent danger. However, the historical records of other Sri Lankan hills clearly indicate that every time major rainfall periods occur, landslides continue to take place there. Unlike many other hills that are sparsely populated, the risk to life and property is very high in Kandy due to the high level of developments on the Kandy hills. It is prudential to take appropriate action in readiness for a worst case scenario as it did in January 2011, instead of conveniently assuming that the hills seem all right and take no preventive action when it is obvious that a real danger exists on the hills. The writer is a Chartered Engineer, Geotechnical Specialist and former head of the Geotechnical and Landslides Division of NBRO.